This plan of Scarborough dates from 1539-1547 and is part of a series which show the state of coastal defences. 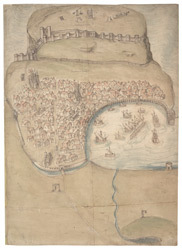 The states of defences were a matter of great concern at this time as Henry VIII feared an invasion from the combined forces of France and Spain. In 1538 Francis I of France, and Charles V Holy Roman Emperor and King of Spain signed a peace treaty. This union gave rise to the possibility that France and Spain may combine forces to invade England. France was England’s historical enemy and Henry VIII’s divorce of Catherine of Aragon, Charles V’s aunt, had offended the militantly catholic King of Spain. Although pictorial this map details the features of the town clearly. Scarborough castle is shown in detail and the extent of the walls and gate houses is indicated. A watch tower at the mouth of the harbour is mirrored by a sentry house and cannon. A figure hanging from gallows outside the city wall is an eloquent reminder of the fate of possible invaders.